In college, my roommates and I used to make fun of people we knew who were always gushing on their significant others (especially on social media). "I have the best boyfriend in the world" and "my fiance takes SUCH good care of me" were particularly annoying. I still find it obnoxious when people constantly do it about their spouses, because it just makes it seem like their is something lacking in the relationship (just tell HIM in person, darn-it!). Anyway, I say all that because what I am thinking about this morning is how great my husband is. He's been working so hard in his MBA program and I am so proud of him. He is a great, generous person and I feel so blessed to be married to him. Okaaay, see why that is just so obnoxious!? Too much, too much. In other news, I finally wore my green maxi skirt and I loooourve it! It's just so very me. I wore it to work yesterday, and it just made me feel like I was attending some sort of ball. I had to lift the skirt to go up and down stairs, so every time I did, I imagined I was Cindarella or something. That's normal, right? Haha how fun! This skirt is perfect for you and yeah, if I had to lift my skirt to walk I would feel like a princess too! And I don't think your gushing today was obnoxious at all! Once in a while is totally sweet. I love that skirt! The color is so pretty! That color is beautiful. I'd like to try one of those bright colors, but they're final sale. How's the sizing? If you don't mind me asking, what size do you usually wear and get in this skirt? I don't mind at all! I would say I generally wear a small, but I got a medium because I have large hips so I wanted to make sure that the pleats laid flat. I'm glad I got the medium, but the small would have probably fit better in the waist (it's a tiny bit loose). Overall, I would say it definitely fits to size, but the skirt is REALLY long. I'm 5'10" and you can see that it hits the ground for me (I do have short legs). I would say make sure you look at the length before you order. If it's too long but it's something you love, you could definitely have it hemmed! Sorry that's a lot of info - I hope that helps! that skirt is sooo pretty!! Nice outfit! I love your shirt! 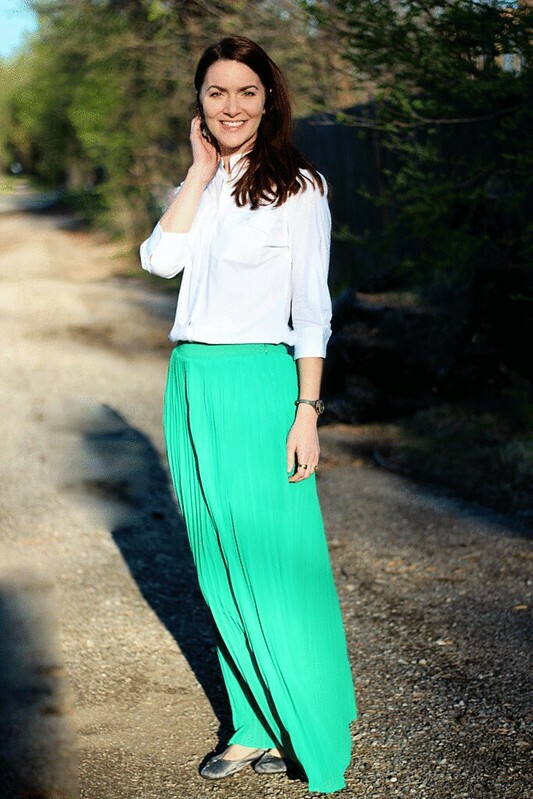 Love that green maxi! What a great color. I really don't understand when people overly gush about their significant other either. You know, like all of the time like they are 14.... It is one thing to be proud, etc, but to just go on and on and on is weird. I am much better at telling the weird stuff my husband does, because that is funny. But I also think it is great you are so proud of your husband! There is a difference between being proud and acting 14. You are totally justified in talking highly of your significant other, but I totally agree that if that's all they talk about, it's a little too much. Also... that skirt is amazing. Yay that's so great for him!!! and I'm loving this green maxi. What a pretty color! I try to only post about the boyfriend when he does something super sweet or says something that drives me insane. I am in a healthy relationship but even I get tired of hearing about everyone else's OMG SO GREAT BOYFRIEND! That skirt is absolutely gorgeous! Love the color! Imagining to be a princess is very normal. 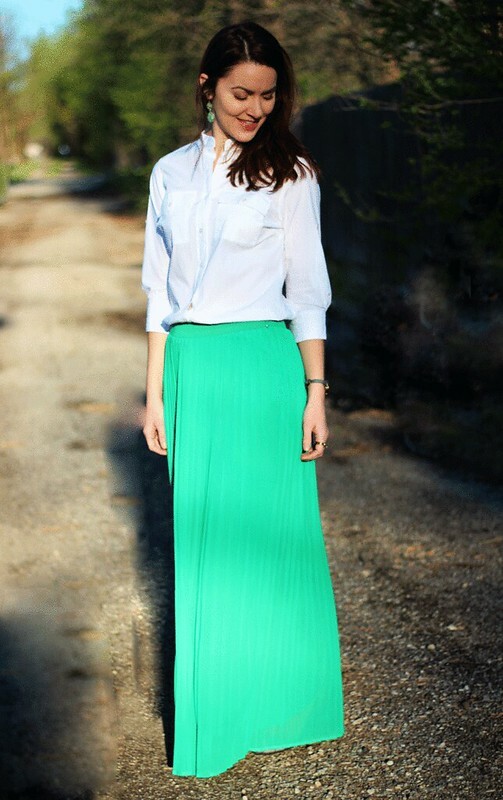 :-) The maxi skirt is cute and in the prefect shade of green. I'm in love with your skirt!! Haha, I have to do that when descending or climbing stairs in my maxi dresses too, and I totally imagine I'm a princess or at a ball. :) Totally normal. Love that green skirt! So cute! I have a skirt like that in turquoise and I love it. I've always wanted a green one like yours. You look so cute! I have a great husband too and it's okay to say it once and a while. And I agree that it gets annoying when someone says it all the time and that there must be something else not good going on in that relationship. 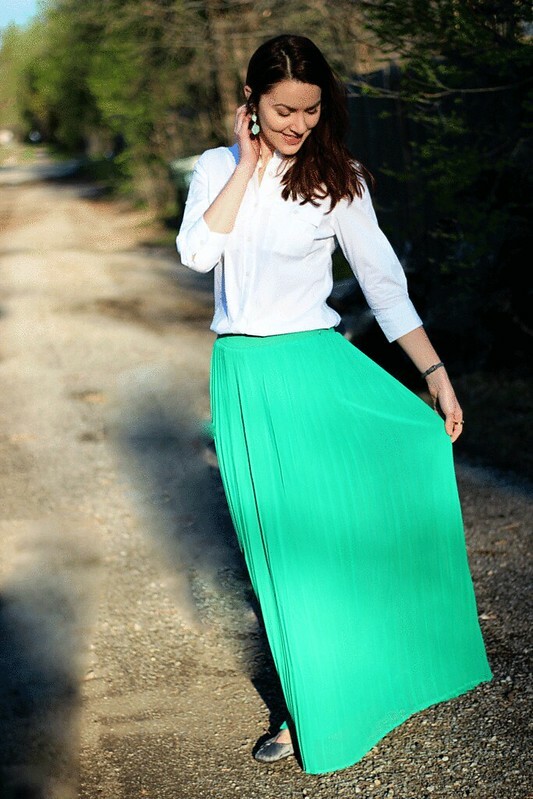 This green skirt is to die for!! Beautiful on you!! Um, totally normal. I gush about my husband all the time because he really is the best. Really truly. I know exactly what you mean about too-gushy couples! However, I would like to take a moment to gush about your skirt. It's SO PRETTY. You rock it like Cinderella until you can rock no more. Green is such a gorgeous color on you! Gushing is allowed every so often! I do find it incredibly annoying when people are posting every 5 minutes about how great their significant other is. I want to respond "Yeah, you're supposed to like him - you married him! I'll just assume you like each other until I hear otherwise, k??" Oh, and that skirt! I want to steal it! That skirt is absolutely gorgeous! It drives me nuts when people gush on social media about their significant other. It just seems so disingenuous to me! You're sweet! I think it's great that you're happy and want to shout it from the rooftops! Also- LOVE the InStyle Essentials less girly top paired with the stunning maxi skirt. You're perfection! What a beautiful skirt! So perfect for spring! These photos are beautiful too, especially the first one where you look like an angel. Are you using a different lens for your camera? Thanks so much Ada! I don't know if anyone has ever told me I look like an angel in a photo before :) Still using the same lens - we just shot these photos in the morning so the light is a little different! Nothing wrong with being proud of your husband! Love that color, so bold and colorful for spring. This maxi is GORGEOUS! I just LOVE the color!! You look amazing in that skirt- I love it! Green really suits you! That's a gorgeous skirt. Try mixing it up with a deep red top for some colourblocking?! Oooh that is a great idea! You look amazing! And I want/need that skirt! So pretty! I think every girl should feel like Cinderella! And I loved you mentioning your husband. Marriage is hard. I always love hearing about people in love and getting along. I think facebook bragging can be really cute sometimes - but only if it's now and then. the constant brags are a bit over the top, haha! An occasional, warranted shout out for the spouse is absolutely acceptable!! :) I know what you mean though. 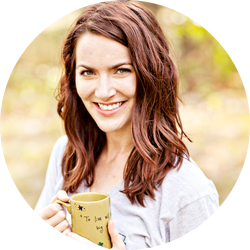 It embarrasses me when my husband introduces me extra compliments. Is that silly? Anyway, LOVE the skirt. I need one. Yes, "need". Thank you for sharing...as always your posts make me smile. Love the color of the skirt! You look great in that skirt! I adore the color, and love anything that makes you feel special (and like a princess). as soon as I saw this outfit I thought: that skirt is GORG. where? how? need! so, I just ordered it in blue :D thanks for all your help! I just know it will be super long because of my shorty legs, but I'm determined to make it work. I actually love the color you have but didn't see it up there. such a great outfit, and these pictures are especially lovely with the bright sunshine! glad I saw this!